When school is not in session, Science, Language & Arts International School offers fun and exciting daily and weekly camps for children to participate in science exploration, art projects, off-campus adventures, and endless fun! Sessions are held during summer and school-year breaks and are open to students enrolled at other schools. We are delighted to offer SLA’s 2019 Summer Camp at our beautiful new Main Campus in downtown Brooklyn at 9 Hanover Place. We are offering our stellar full-day French immersion program for rising Pre-K 4s through grade 6. SLA Summer Camp 2019 runs for five weeks from Monday, July 8, through Friday, August 9. Registration is by the week. Payment plans and sibling discounts are available. Early bird discount runs through May 1 with coupon code earlybirdsummer2019! Summer at SLA means outdoor adventure, STEM exploration, art, and fun – all in French! Every day, there’s an outdoor quest as well as science and art projects linked to the theme of the week. Whether your child is a beginning or fluent speaker, our scaffolded immersion environment ensures support for your child and lots of opportunity to expand vocabulary. Drop-off begins at 8:15 AM. Camp Circle begins at 9:00 AM. Pick-up is from 4:30 PM to 5:00 PM. Junior Counselor Program for rising 5th and 6th graders! Limited spots are available for these positions per week at a reduced rate of $450 per week. Eligible students participate in all activities, and are given special responsibilities. No additional discounts applicable with Junior Counselor rate. Send an e-mail to programs@slaschool.org for questions related to camps at SLA. Storytelling! Singing! Dancing! Art! Cooking and eating! Children will delve into the rich and diverse cultures of several francophone countries while building their cultural (and French) vocabulary. Rich cultural immersion with teachers native to the countries we will explore. Outdoor quests may include walking trips to neighborhoods and markets to see and sample foods, fabrics, musical instruments, and arts. Summer at SLA means outdoor adventure, STEM exploration, art, and fun – all in French! Every day, we have an outdoor quest as well as science and art projects linked to the theme of the week. Children will enter the realms of fantasy and the imagination as they engage in theater games and by creating stories in which they play the characters of their choice. 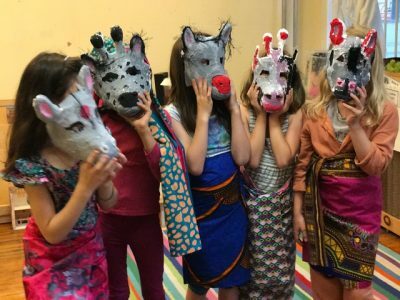 Mask making and an exploration of movement techniques will bring their character to life! Children will present their work at the end of the week to their fellow campers in an end-of-week performance. New York City is a concrete jungle, but plant and animal life is all around us! Local flora and fauna will come alive as children learn about and interact with the plants, trees, insects, and animals around them. Children will dig in the dirt, examine plant life in the city, plant their own indoor mini-gardens, look closely at the life cycle of a plant, become stewards of local trees, and spread the seeds of their newfound knowledge of plants… all over our great urban landscape. They will also explore the natural habitats around us, go birding around NYC, and find out about what makes the New York City area a unique spot for wildlife. Outdoor quests will include hunting for species in local parks and gardens, nature walks, birdwatching, a wildlife treasure hunt. New York City is a young builder’s dream. Children will explore varying architectural styles in Brooklyn and the city at large, from the tall towers of Manhattan and Downtown Brooklyn to the sedate brownstones of residential NYC, while deepening their concepts of geometry and physical science. From our very own windows, they can watch a building grow from the ground up! They will go on scouting trips and then come back to build models from their photographs and sketches, build towers and structures with blocks and other building materials, and enjoy art and photography, all while broadening their builder’s vocabulary. Outdoor quests will include hunting for the basic components and shapes that make our buildings stand tall; counting, comparing, and charting Downtown Brooklyn’s skyscrapers over the last several years; looking at the skyline from the perspective of a young architect. Possible field trips: Walk under and across the Brooklyn Bridge, local walks to compare and contrast various architectural styles, visit the High Line, various museum exhibits of NYC over time. (All new content) Storytelling! Singing! Dancing! Art! Cooking and eating! Children will delve into the rich and diverse cultures of several francophone countries while building their cultural (and French) vocabulary. Rich cultural immersion with teachers native to the countries we will explore.